Summary: This walk is possibly the most popular of any walk of over 10 miles in the eastern part of the North York Moors. 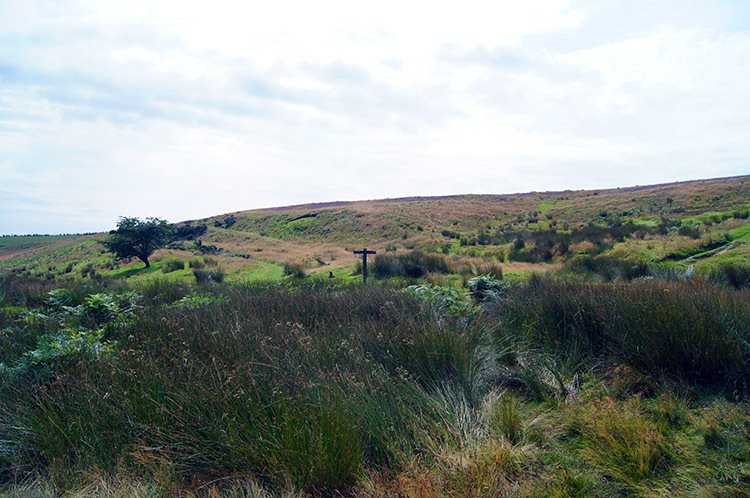 The reason is that this circular visits two outstanding natural features of the moors and despite being close to each other they are vastly different in appearance and character. 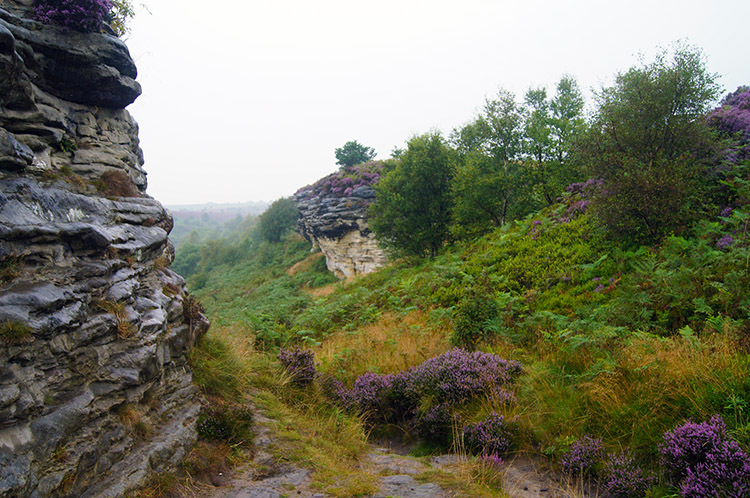 The Bridestones are a series of elegantly shaped grit stone outcrops while the Hole of Horcum is a vast gouge in the earth. This walk visits both yet there is much more to enjoy on this walk including the lushness of Stain Dale, the glory of open Levisham Moor and a superb finale along the fringe of Levisham Wood and then up Cross Dale which looks as if it should be transported south to the Yorkshire Wolds, being so like the dales of that area. Altogether the various features make this a terrific walk. 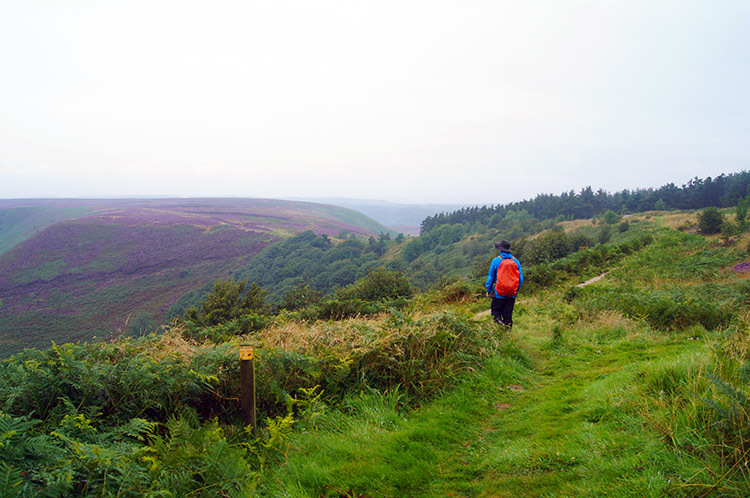 I drove over to Pickering from Harrogate on a Friday morning to meet John Lister and do this 12 mile walk in the eastern North York Moors. It was a fairly decent morning in Harrogate, the weather forecast was promising with the odd chance of some rain in mid-morning but an equal chance of it staying dry throughout the day. As I climbed over Sutton Bank the view toward the coast was bright but as I passed over the high road to Helmsley I noticed it getting darker in the south. Still it stayed dry as I made my way from Helmsley to Pickering and only when I climbed the A169 Whitby Road toward our starting point at the Fox and Rabbit pub did I realise it was not going to be a dry start. Rain started lightly and continued to do so as I parked up waiting for John to arrive. He was only 10 minutes behind me but by the time I saw him arrive the sky had darkened considerably and heavy rain followed. We sat it out for fifteen minutes before deciding to go for it. And so we put our wet gear on and set off on our walk in the rain. John dressed in full wet gear. I decided on a more optimistic approach, putting my coat on but decided against wearing wet weather trousers something I much prefer to do unless I am convinced the rain is set in for the duration of the walk. I was convinced things would improve and we would see sunshine. John was not too sure. 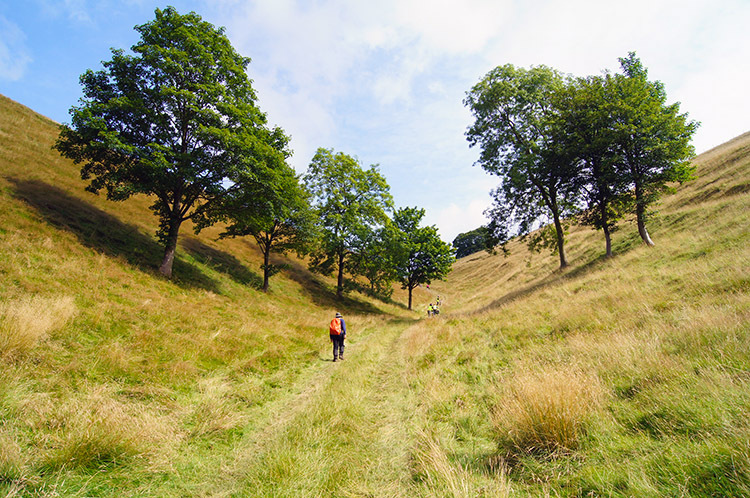 After a short section of level walking we descended steeply through High Wood towards Staindale Lodge. 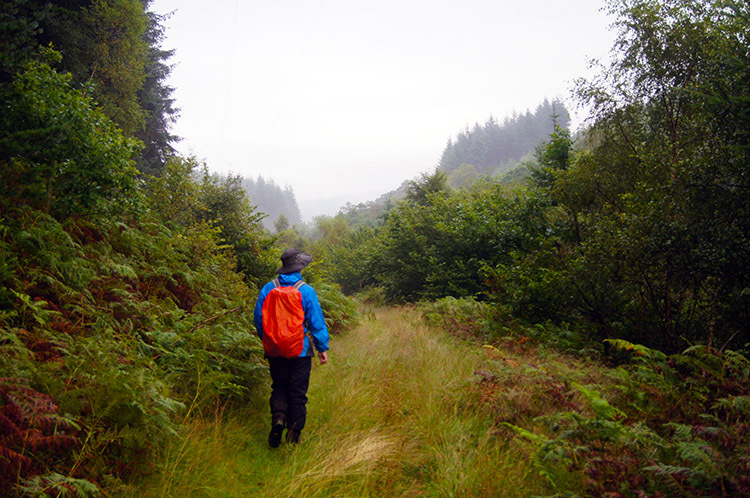 By the time we reached the lodge the rain had relented from heavy to mere drizzle but still enough to keep us wet. Signs were good though, a beautiful sight of water evaporation rising from the treetops in Stain Dale could be seen all around as we walked on the floor of the valley. Despite the drying conditions my trousers were now soaked above the knees as much of the walking we did through Stain dale was in deep lush grass which fringed the narrow tracks we followed. It had a cooling effect but I worried not as we had a climb to come that would warm me up. The climb was to be gradual and last for six miles until we reached Levisham Moor. First it was flat through Dove Dale, a lovely place and then the climb started quite steep at first but short to access the National Trust Bridestones site. As we climbed from Dove Dale via Needle Point I looked over to the east and saw the Low Bride Stones. At the top of Needle Point we stopped at a conveniently placed bench to look over to them while having a bite to eat and a drink. As we rested and looked over Dove Dale I thought back to last year when I had walked to the Low Bride Stones from Dalby Forest after being invited to speak at a National Trust conference. Afterwards I joined the staff on a short walk to the Low Bride Stones. 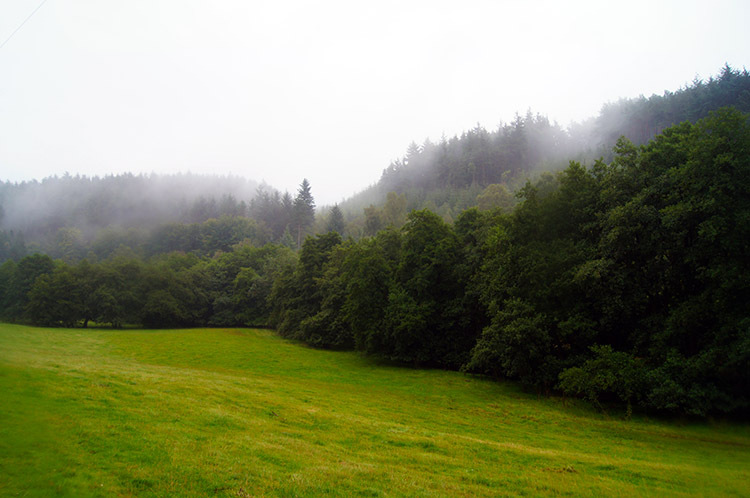 Back to today, we did not stay at our resting place beyond eat and drink as another spell of light rain began. Immediately on resumption of our walk from Needle Point we walked to the first of the High Bride Stones. 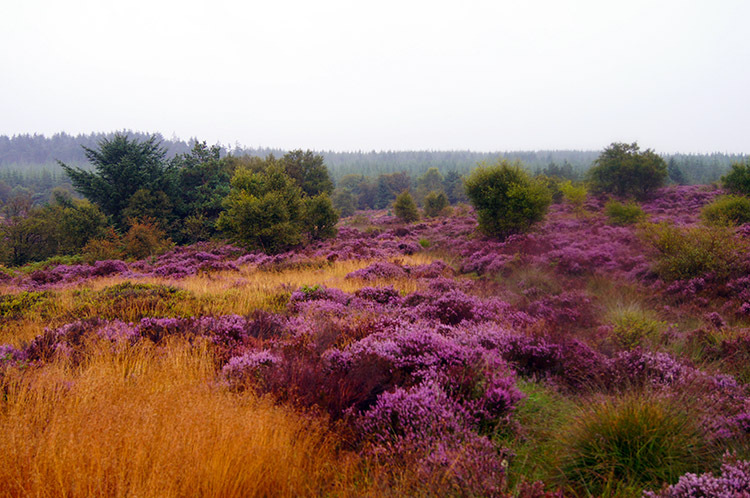 The approach was lovely along a picturesque heather lined track. At the first stone I remarked "John, if only we had known we could have taken our break here and stayed dry" He agreed, the Bridestone had a perfect weather shelter with a natural windbreak and I am sure many walkers have sheltered in there in similar conditions. 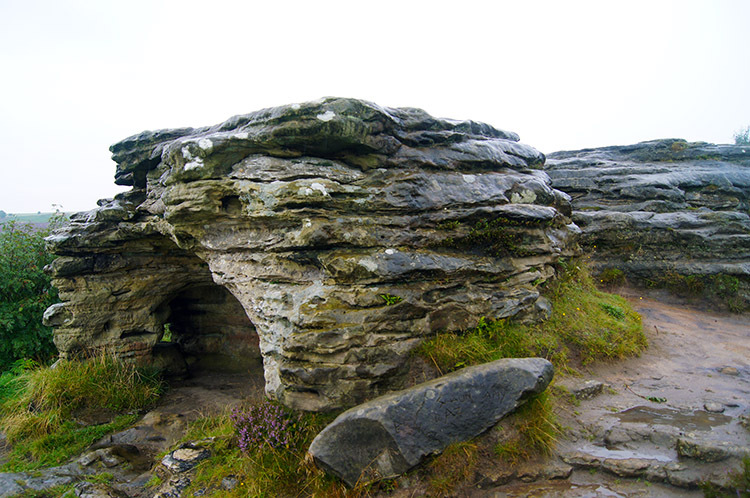 The High Bride Stones were a lovely place to explore, most stones having their own unique characteristic shape. 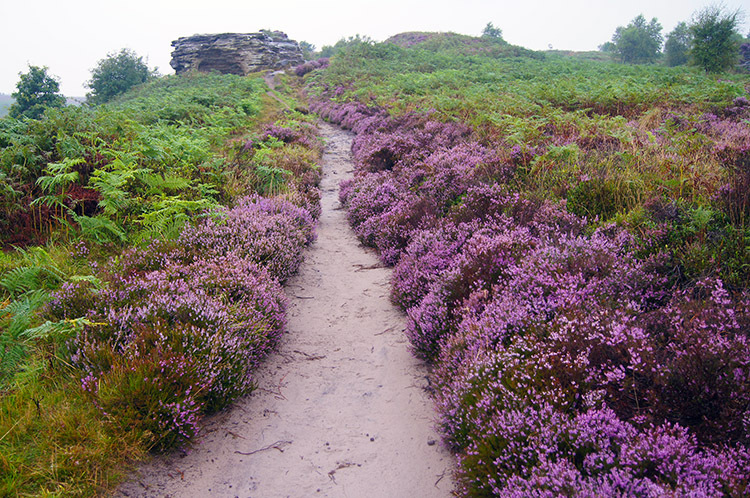 Some of the Bridestones were adorned in colourful heather which added character to them and to capture as much of the beautiful surroundings as I could I took a short detour from our round trip to explore them a little more before returning to the path. 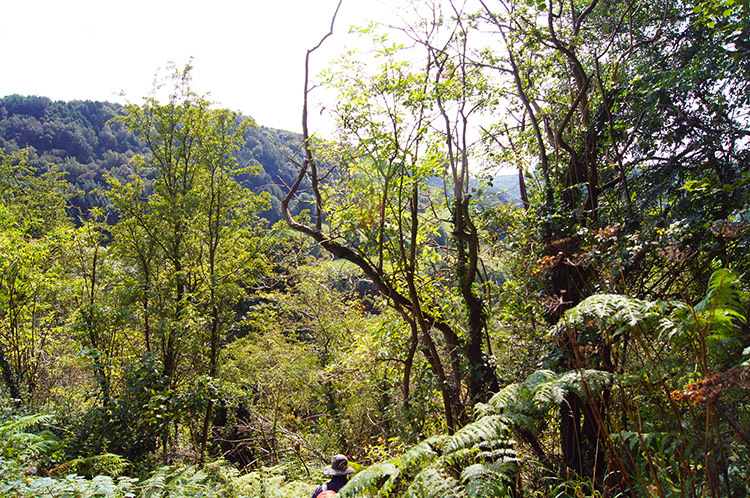 The short extra section of walking is included in the downloadable trackfiles. From the Bridestones John and I walked to Bridestones Griff and then across moorland blanketed with swathes of flowering heather before following a track beside an old earthwork towards Newgate Moor. 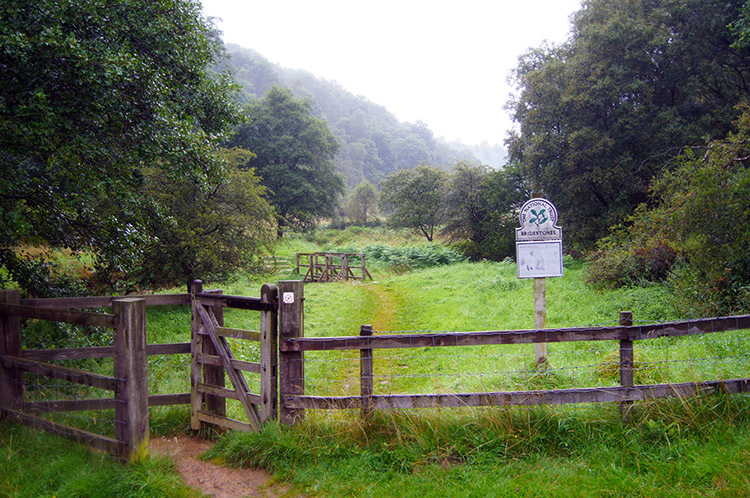 After passing through a gate we continued on the edge of the moor along Newgate Brow and it was on this section of the walk that the rain finally stopped. There was no sign of blue sky though, it remained a frustratingly dull sky. While walking along Newgate Brow a sight to my right caught my attention. It was a hill of interesting shape and I knew it to be one of legend. I had caught sight of Blakey Topping for the first time. 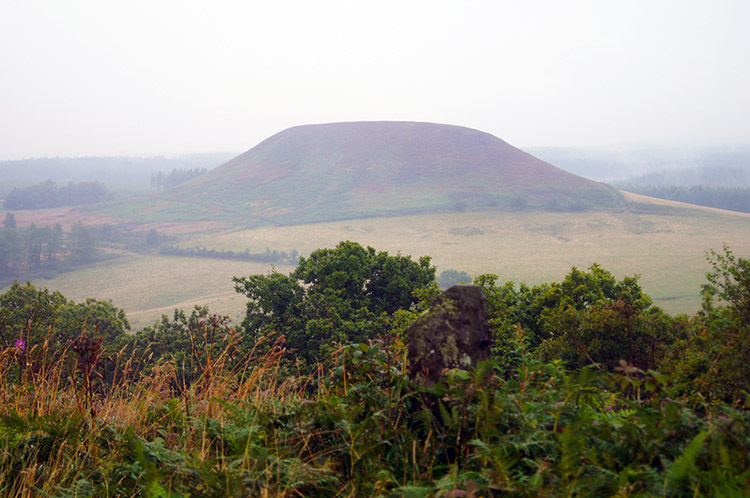 It is known as a 'sacred hill' as is nearby Howden and the famous rounded Silbury Hill in Wiltshire. There is an arrangement of four standing stones around its perimeter and while not complete it is though others have been plundered or used as material for local buildings. More on these legends can be found on this Blakey Topping page. 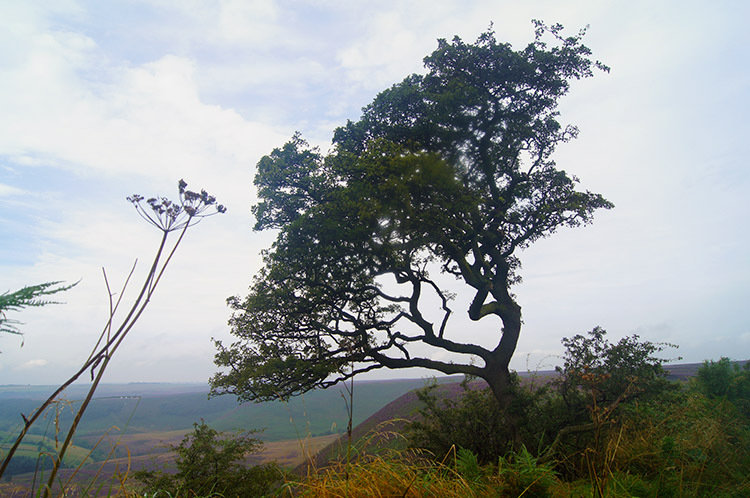 Another more romantic legend has it that the nearly Hole of Horcum was formed by a giant who used the spoils top create Blakey Topping. 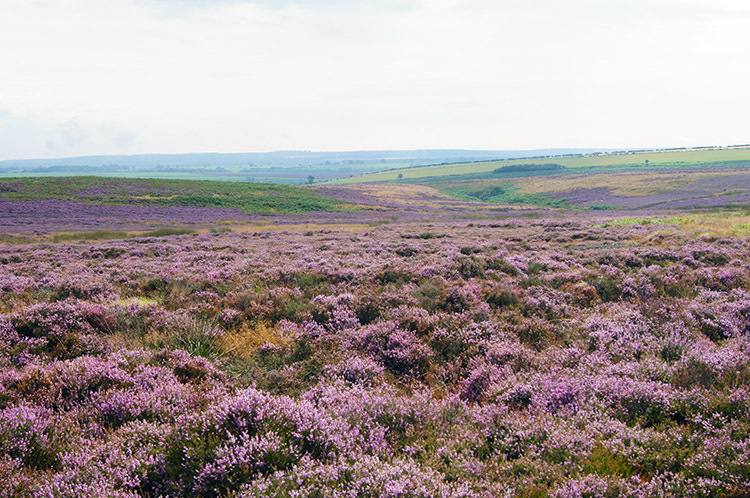 The only problem with that theory is that the Hole of Horcum is vastly bigger than the material mass of Blakey Topping but more on that when we reach the Hole of Horcum. On passing Blakey Topping John and I followed the Old Wife's Way and while doing so I looked south to glimpse the first signs of blue sky breaking through. At first John did not believe me but as it got closer he too conceded we were in for a lovely afternoon. After passing a small copse we reached the A169 Pickering to Whitby road which we crossed with care. To our right vehicles were parked in the large lay-by and some were patronising the fast food caravan parked in this picturesque spot. Many of the vehicles occupants crossed the road to take their drinks while gazing down into the vastness of the Hole of Horcum. 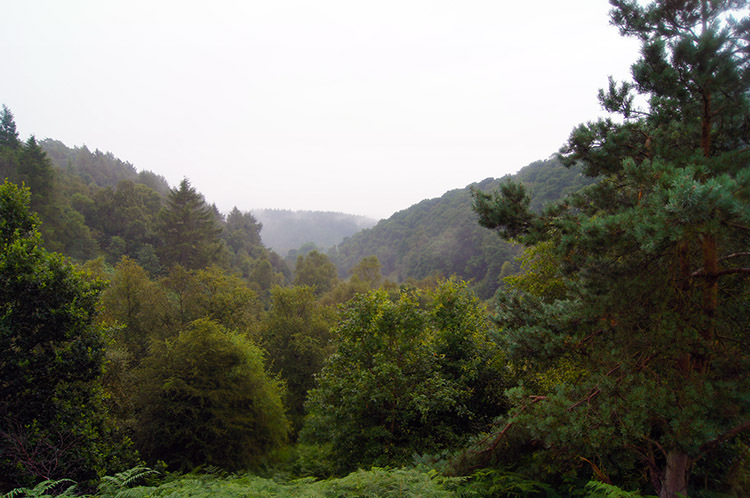 It is indeed a natural wonder and one of the most visited places in the North York Moors National Park. Back to legend and fact now. As I noted in the last paragraph legend has it that the Hole of Horcum was created by the giant Wade during an argument with his wife. 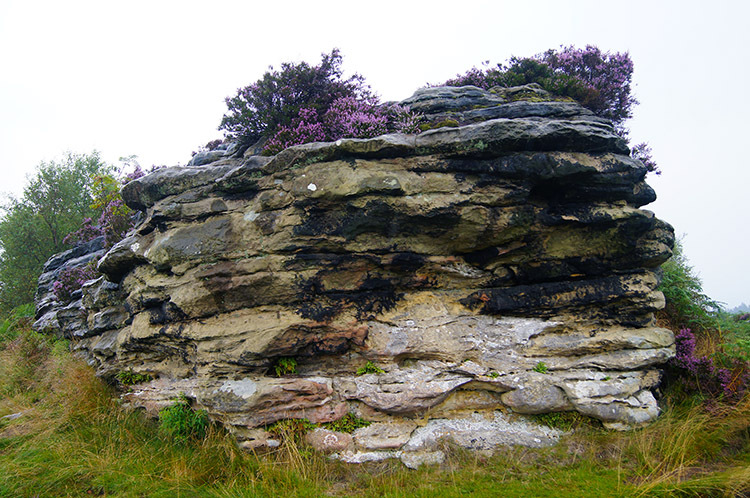 He scooped up a handful of earth to throw at her, leaving behind the Hole of Horcum. The pile of earth became Blakey Topping. Fact now. Geologists tell us a different story. The hole was actually created by ‘spring-sapping’ and rainwater seeping through the porous rock. Springs are created when the water meets an impenetrable layer of clay below. This water gradually erodes the sides of the hole and enlarges it over many thousands of years. 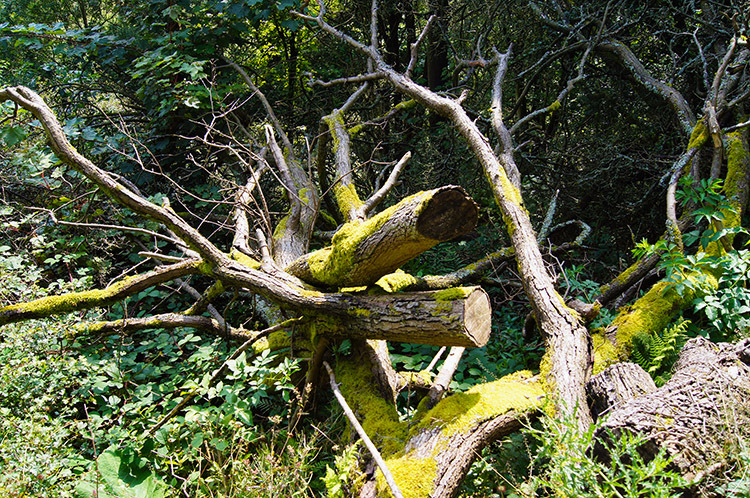 Spring sapping can also cause landslides that rapidly increase the rate of erosion. So there you go, you can romanticise or face facts. Whatever your conclusion one thought does remain; the Hole of Horcum is a wonderful awe inspiring place. John and I continued to gawp at the huge bowl below us while making our way around its northern perimeter. We were sometimes drawn to look north though because also in view towards RAF Fylingdales was vast swathes of heather laden moorland. It was a brilliant scene wherever we looked and with the sun finally breaking through the colour of the heather blossom increased in grandeur. 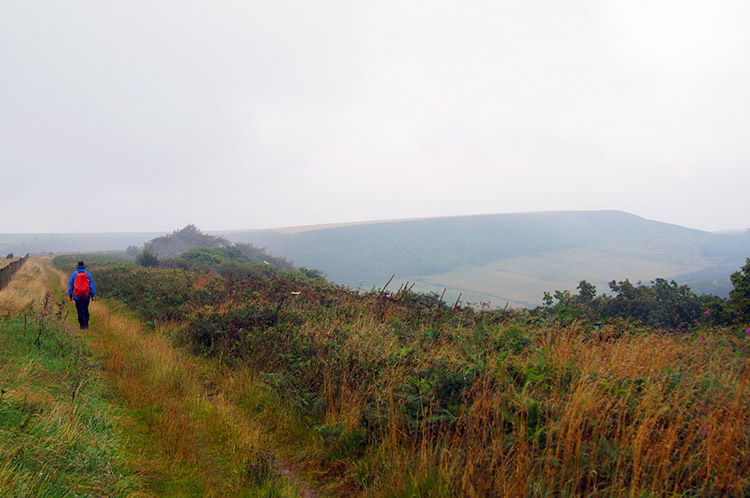 We walked in direction from east to south as we rounded Levisham Moor towards Seavy Pond. The pond was more like a puddle despite the wet summer of 2012. I saw much more water it when last I walked on the moor in a springtime walk some years ago. We continued on with sunshine penetrating and heat increasing. John and I left Levisham Moor by Dundale Rigg. Before we did so we took a few moments to rest by the pond. Some paths cross here and while stood I noticed a walker approaching from the west. 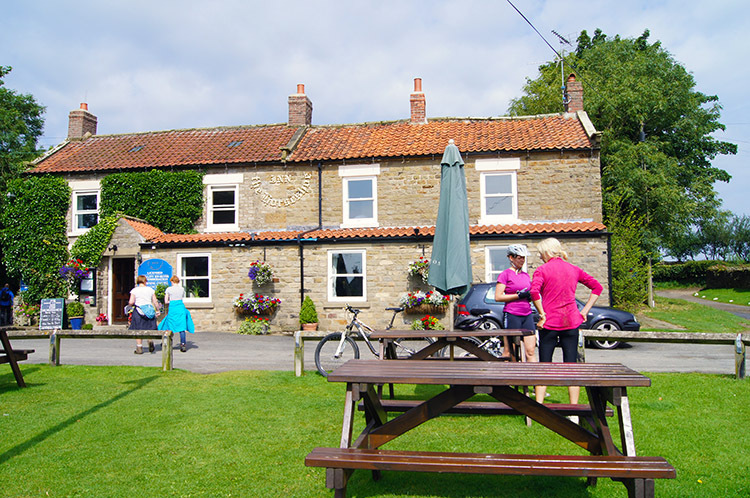 John mentioned Levisham Station was in that direction, a stop on the North York Moors Railway. 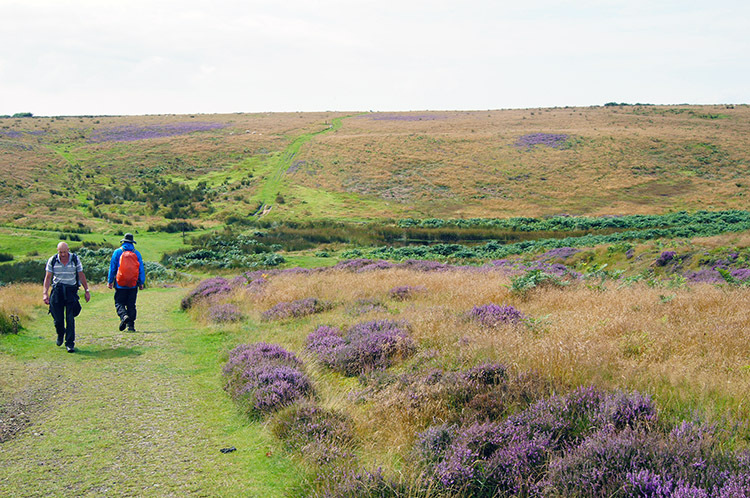 Perhaps he had disembarked from a train with the intention of making the short moorland walk to Levisham for lunch. Not a bad idea. 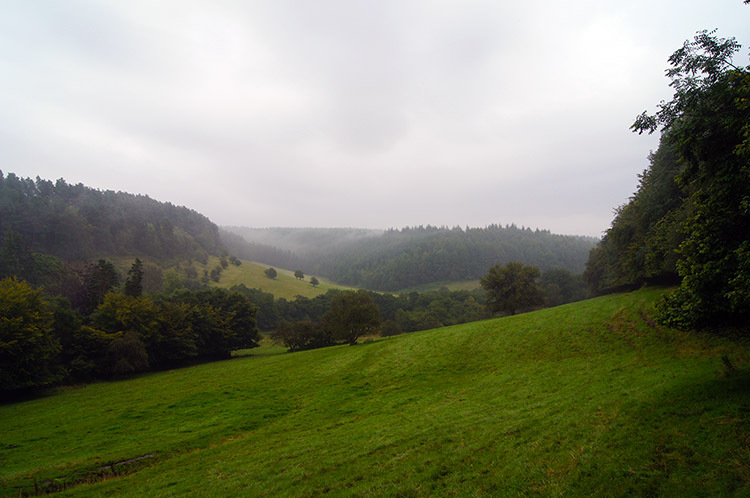 Before the walker reached us we left Dundale Rigg and made way to Levisham ourselves. On the way we passed a family of mountain bikers and a National Trust Ranger maintaining waysigns. We reached Levisham in glorious sunshine, a wonderful development after an inclement morning. People were already grouped on the outside tables of the Horseshoe Inn. We stopped for a well earned drink. Sitting outside the pub on a spare table in the quiet picturesque village was a superb way to enjoy our drinks. We only had one pint each but I was nearly tempted to another. "It's only too easy" John said. But we did not succumb to temptation and on drinking up we continued on our way. We walked down the centre of the village, one of grand houses and cottages before descending by road and round a steep hairpin bend before making a steeper descent to access Rowl Wood. It was steep and quite slippery so we descended with utmost care. Still I slipped and landed on my backside at one point, not too discomforting but leaving me with a slightly muddy bottom and dirty hands which I quickly cleaned in the long grass. 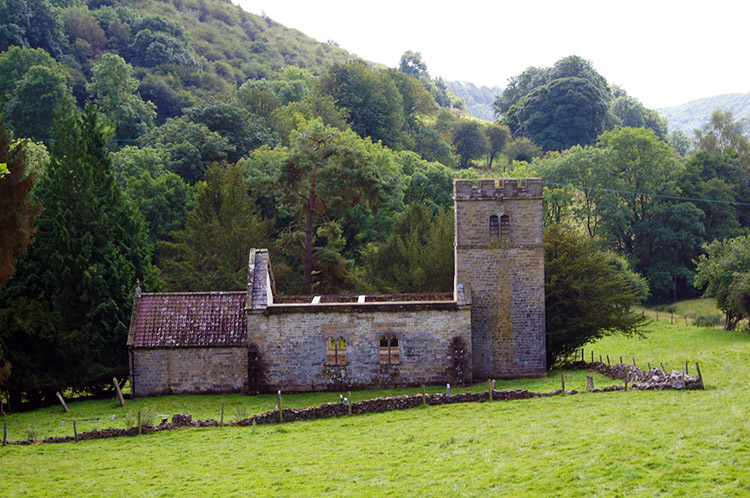 As soon as I had done so and looked up I noticed the magnificent setting of the original Levisham Church. How sad I thought for such a magnificent structure in such an idyllic setting to be abandoned and it being replaced in the villagers favour by an inferior one in the centre of the village. However, on researching the history of Levisham's churches I was surprised to find that this isolated church was one stood next to a main road and not always isolated from traffic. Hard to imagine as John and I walked on and left the ruins to their prolonged peace. We walked on into woodland once more, this time availing of its shade while this morning we availed of its cover. The final few miles were as full of interest as all that had gone before. 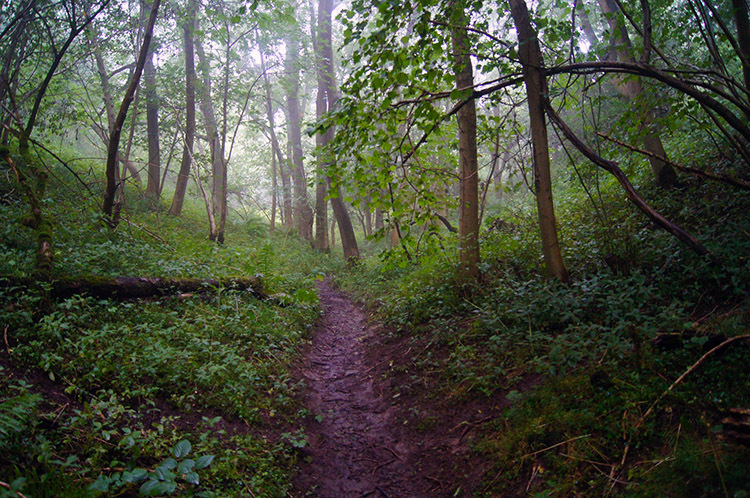 First we walked a lovely track alongside Levisham Wood although at times there were muddy areas which we had to struggle around. From Ness Head we crossed fields to Farwath and then more fields to Crossdale Spring. Here we came across more mountain bikers. 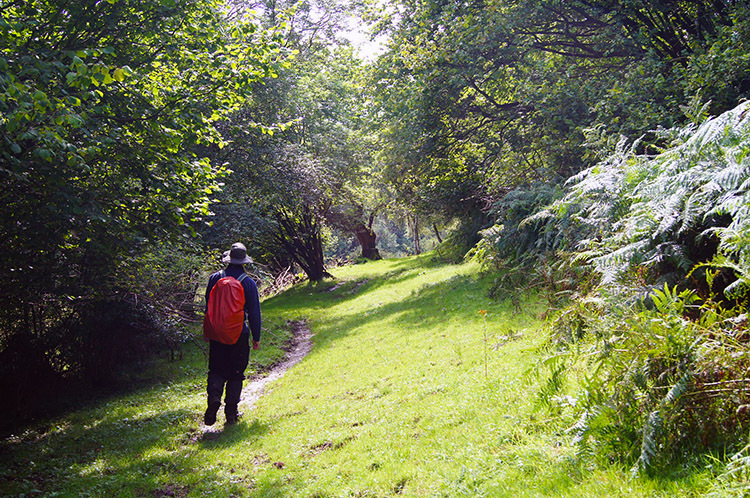 From Crossdale Spring we continued on to walk up though Cross Dale. John mentioned "You may think this dale more typical of the Yorkshire Wolds than North York Moors" and immediately on spotting the first series of steep sided grassed dale sides I had to agree; they were so much like the Yorkshire Wolds. As we walked though the unusual terrain we came across the same family of mountain bikers we encountered on Dundale Rigg. Here some were walking the bikes and one mentioned "I agree, sometimes it is better to walk" I nodded. Soon after we reached the top of Cross Dale and walked a short furlong back to our starting point. The scene around the Fox and Rabbit could not have been more of a contrast from when we left five hours earlier. Then it was damp and miserable, now it was bright and joyous. But then the walk had a lot to do with that, a fantastic walk of thorough interest and of enjoyment.